Optimize onsite search with part 4 of our guide. Shoppers typically have a good idea what kind of product they are looking for when using an onsite search box. Even if they cannot always express their intent in words, they have clear expectations from the search results. However, sometimes search engines return results that confuse customers, and at worst returns nothing. Another scenario stems from search engines trying to be too smart and returning fuzzy matches - searches for which no exact results can be found, but where some sort of similarity matching led to results. Usually, fuzzy matching techniques such as spell corrections, phonetic matches and automatic query expansion can reliably solve the search challenges they were developed for. However, at times, these algorithms can be a little too eager and correct perfectly fine words, which leads to unexpected and confusing results. The first way of improving these issues is to optimize the fuzzy matching algorithm for higher precision. While this is certainly a valid approach, it may not be the most efficient and can decrease the algorithm's power to correct real mistakes. Typically, it is much more efficient to improve UI and UX for these cases, by making it obvious to the customer what has happened. 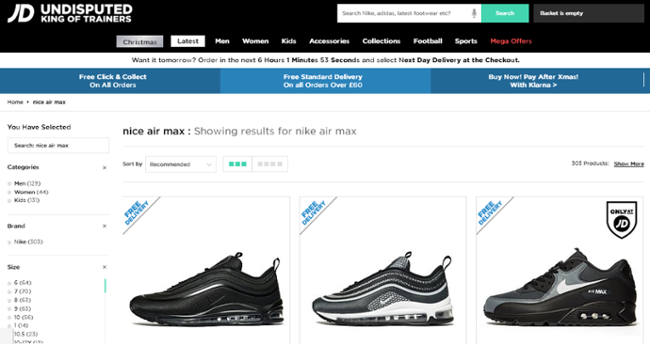 If a search engine simply returns results for 'nice shoes' instead of 'Nike shoes' shoppers would justifiably be surprised to see formal shoes and boots. However, if we tell them that we didn't find anything for 'Nike shoes' and instead searched for 'nice shoes', the confusion is gone. Of course, this should only happen if there are no Nike shoes! Even though web search and onsite product search are very different, this is an area where we can learn from Google. For example, when making a spelling mistake on Google, the customer is immediately informed what happened. Also visible on Google is a link to overrule the algorithm in the few cases it's wrong (and there are different interpretations). This design pattern of allowing shoppers to correct the engine is generally useful whenever advanced algorithms are used, be it for spell corrections or automatic query understanding. The option to overrule the algorithm not only corrects the issue, but can also be used as direct feedback and input for the algorithm itself. Another common reason for poor search experience is when customers expect to find a specific product that isn't sold. In these cases, it's usually not recommended to try finding similar sounding words or other fuzzy matching techniques. It is much better to offer semantically similar alternatives to entice shoppers to consider potential substitutes. For example, someone who is looking for 'Nike shoes' is likely to be more interested in 'Adidas shoes' than 'nice shoes'. In any case, you need to make sure to tell customers that the results are not exact matches to their search. A few years ago, Amazon faced a long-running lawsuit because it didn't state clearly enough that the results for searches for a watch brand were in fact by a different, similarly styled brand. In the end, the lawsuit was dropped, but it was a salutary lesson for all retailers and a good example of poor customer experience. Rather than surreptitiously trying to sell other products it's best to be absolutely transparent about what you don't stock. Tell your customers in bold letters what their alternatives are (note, there are different opinions on how bold the letters should be). 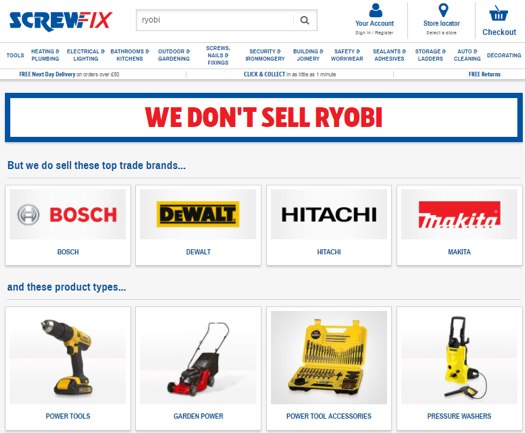 Screwfix chooses to make it very clear! To make such a page even more compelling, consider explaining to shoppers why the brands you stock are in fact better than what the customer was looking for. Another commonly used design pattern is to show a mix of alternative searches. Here too, it's key to be transparent about what's happening in the background. If it's unclear what aspect of a search a shopper is most interested in, list the most likely and have them decide. A good example of what this looks like can be found on the Dutch department store, de Bijenkorf. Sometimes even the best search engines can't understand some queries. For example, the other day the phrase “zxwzaqwwqazdiseased" turned up in a random sample for a search evaluation project. I'm still not sure if that was supposed to be an actual search or if it was the result of a cat walking across the keyboard. If the search engine can't understand an input, we should help the customer with an effective zero results page. 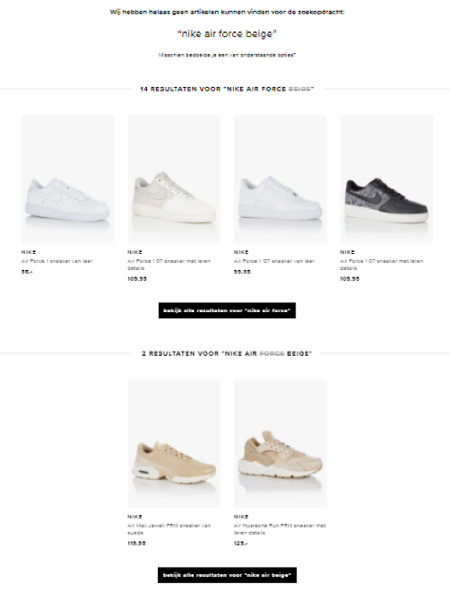 The main goal for zero results pages is to get shoppers to continue looking for whatever they were trying to find. In our fifth and final blog post of this series, we discuss how to help shoppers navigate even the largest search results pages. Look out for the post next week.